In honor of the late Sophia Petrillo, and the fact that pizza is Italian, allow me to set the scene...picture it: small town in Illinois, 1994. Pampered Chef party, hosted by one of my mom's best friends and put on by the mom of my best friend. Twenty ladies and their children listen as Jeri works her magic, telling about all the wonders of the products she is selling, just like an infomercial, but even better because she is hilarious and the ultimate people person/saleswoman. 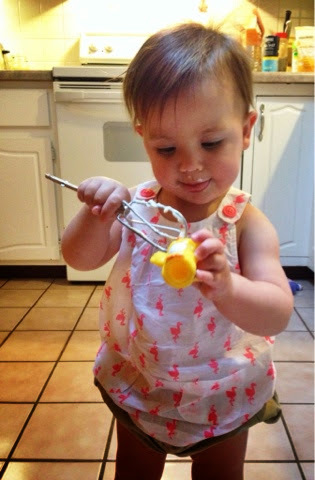 And then, cue the singing angels, she brings out the trays of snacks prepared on/with her miraculous kitchen gadgets. And one of those snacks just happens to be, you guessed it, COOL VEGGIE PIZZA. Summery veggies, creamy tangy "sauce"...it's like taking a bite of sunshine. When I'm craving warm weather food in the middle of winter, this is exactly what I dream of. I've changed the recipe a million times, but it always tastes delicious. 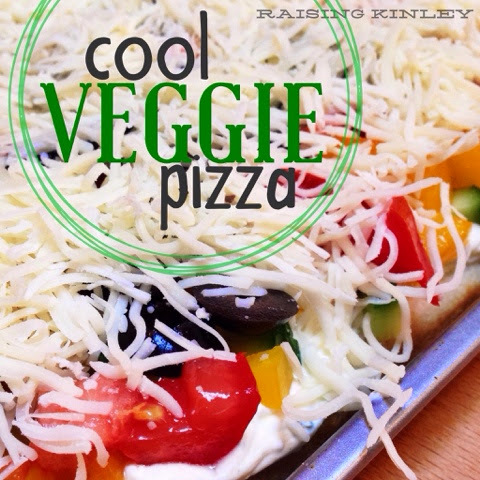 Cool Veggie Pizza just happens to be one of my all-time favorite foods (if you couldn't figure that out by the fact that I remember every detail of the Pampered Chef party twenty years ago where I had my first taste) and one of my go-to potluck recipes. The girls at work used to go bananas for this stuff, and I guess it's time to share my secret recipe. 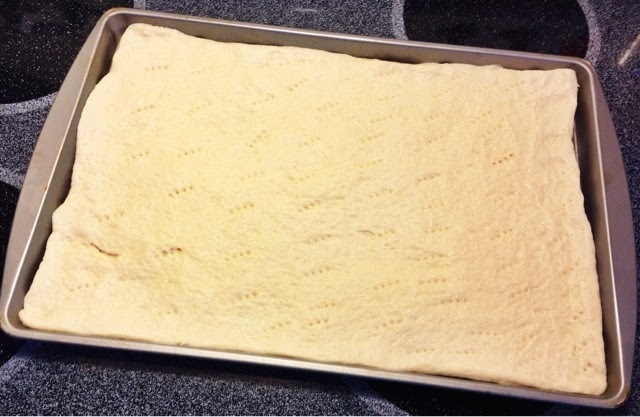 Roll your pizza dough out onto a greased cookie sheet, use your fingers to press it to the edges, and poke a bunch of holes in it with a fork. Read the instructions on the package and bake for the shortest amount of time recommended. 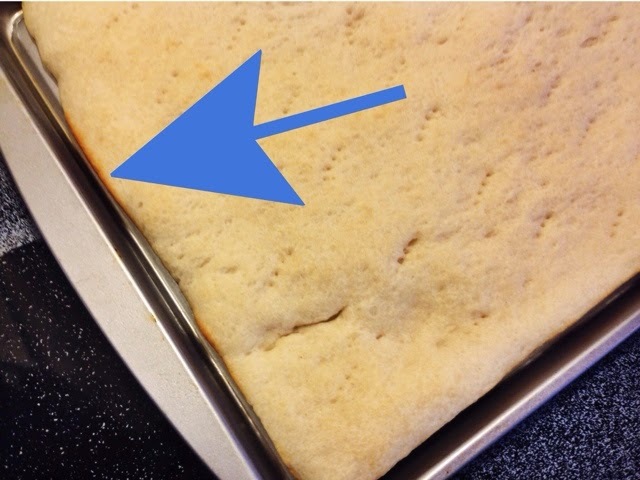 Let the baked crust cool for a few minutes, and when the pan has cooled enough for you to touch it, move it to the fridge to finish chilling out. 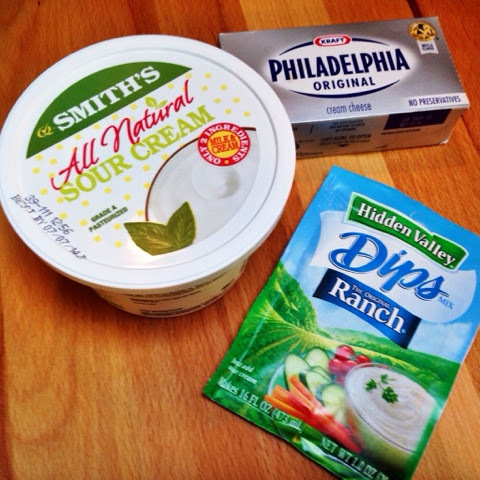 Now it's time to mix the cream cheese, sour cream and ranch dip mix. 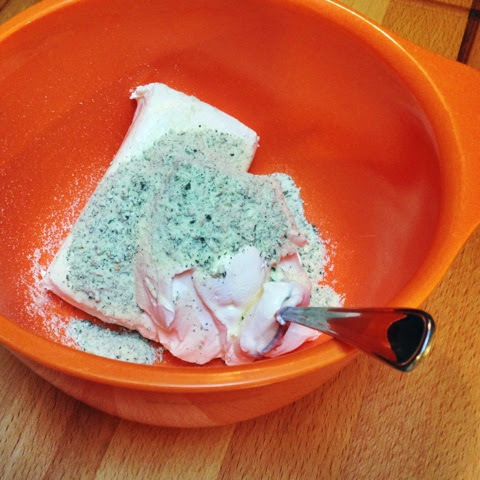 I never ever remember to set my cream cheese out to soften, so after making this a million times and getting ticked off at myself, I came up with a solution. Just use the mixer! 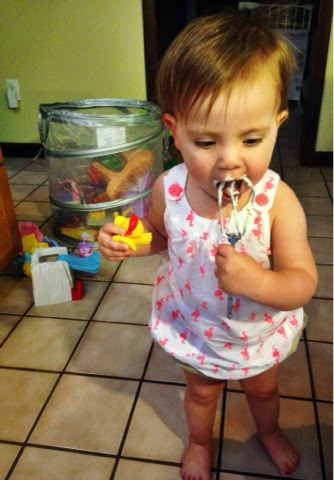 Kinley liked it so much, she decided to give her little chicken a taste, too. If you are making this ahead of time for a potluck or dinner, wait to do these next steps until you are ready to eat it. Cool Veggie Pizza doesn't keep very well, it gets pretty soggy. When I used to make it for work potlucks, I would do everything up to this point the night before and then assemble it right before I left my house in the morning. 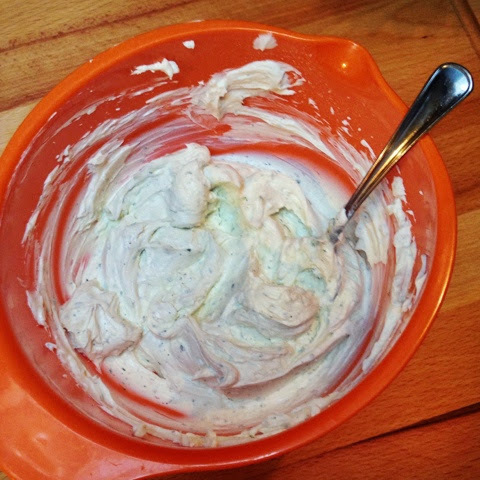 Go grab your chilled pizza crust and slather on your ranch cream cheese mixture. 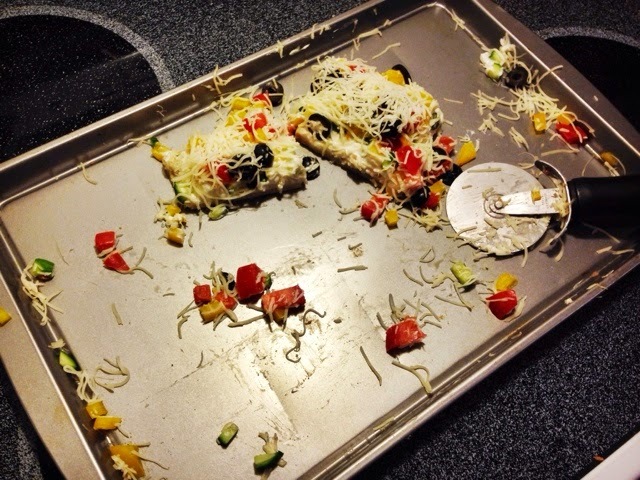 Here's a handy tip: it's really hard to slice Cool Veggie Pizza after you put all the toppings on, so it's a good idea to just do it at this point after the cream cheese mixture is evenly spread. 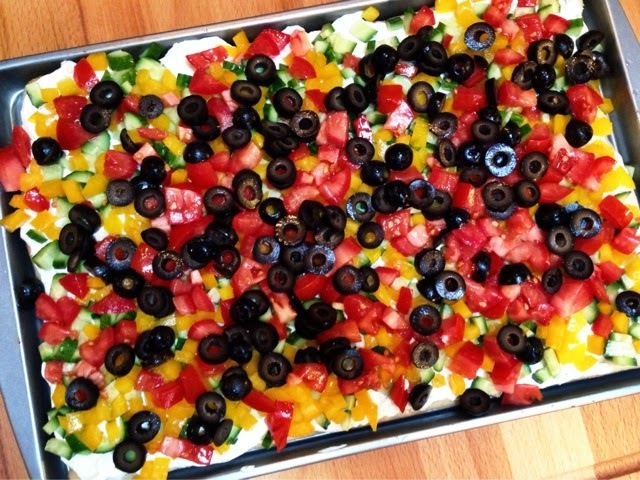 Just squish the veggies down into the cream cheese by firmly pushing them down with the palm of your hand. That just makes eating the pizza a little easier and a lot less messy. Now, you can stop there, but Dave had the idea of adding cheese to the top, and since we gave that a go, we haven't gone without. 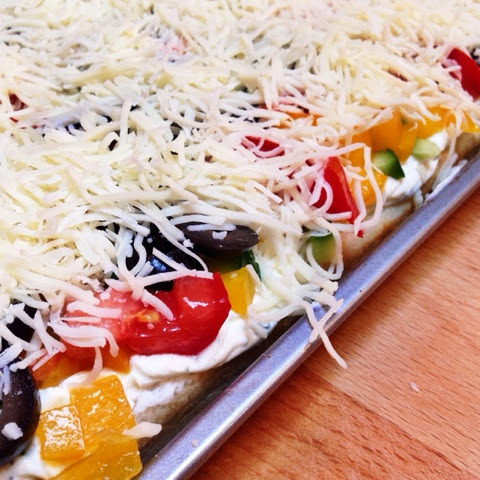 If you do want to use cheese, now's the time to sprinkle it on. Apparently I am not the only one who loves a cold pizza around here! Haha. This stuff is definitely not healthy, but, man-oh-man, is it yummy. 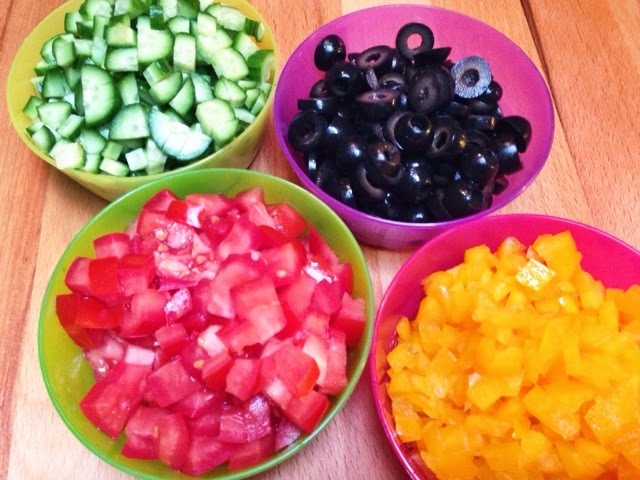 And, hey, it might even get your kiddo to eat some veggies! It didn't work on Kinley--she had mac and cheese as usual--but ranch on anything is usually a kid-pleaser, right? The original recipe called for Italian dressing mix and it's super yummy in this, too. Just another option. Talking about Sophia Petrillo at the beginning of this post got me thinking about cheesecake, so I'm off to whip one up. Yesterday was kind of awful. We got up at noon, ate lunch, and went to Sam's Club. All of that was smooth sailing and, bonus, Kinley fell asleep in the car on the way home. I smoothly transferred her from her car seat to her crib and she didn't even open her eyes a teensy crack! I patted myself on the back on my way downstairs, made plans in my head to finally get the mop out, and headed back out to the garage to unload the ginormous bag of tortilla chips, jug of salsa, and 5 lb flat of strawberries. No sooner had I put one foot back in the house, she woke up. Screaming. It was pretty much like all the days we've been having lately. SuperBaby has come to the conclusion that naps are lame and unnecessary, so she will no longer be participating. Unfortunately, after 4 or 5 major meltdowns yesterday, it seems she clearly still needs a nap. She cried when I used the word "scoot" while we were playing. I'm assuming that was because that is also the word I use to tell her to back away from the oven when I am removing hot things from it, and just like her momma, Kinley does not like to be bossed. She cried while I mopped because, although she could see me, I was more than 5 feet from her. She cried because I turned on the shower, peeled a banana without her, drew a puppy with sidewalk chalk, helped her open a flap in her Spot book, and ate the Teddy Graham she shoved in my mouth. No explanation for any of these. Needless to say, it was a long and patience-trying day. And the two before it were exactly the same. Something had to give. Duh. She needs a schedule! I know how important schedules are to littles, so why it didn't occur to me until breaking point to make one for Princess SuperBaby is beyond me. Now that it has occurred to me though, I am not wasting another precious day! First of all, getting up at noon (or 1:00) is over. Sorry, Kin. You can do that again on weekends in 15 years. I think 10:00 sounds perfect. 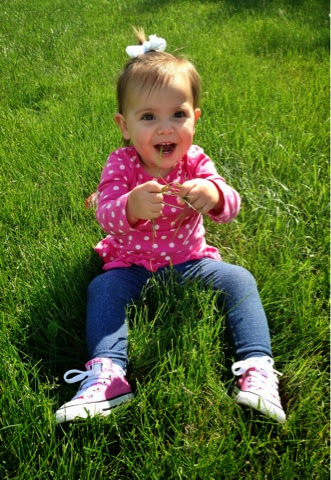 And I know we need books/songs/flashcards time, sensory/art time, and tons of play/outside time. Plus, we definitely need NAP TIME. Period. This is my wishful thinking schedule, so I'm already guessing a lot will change, but we needed a jumping-off point. I'm also assuming the first couple of weeks are going to continue to be fussy and awful, but hopefully Kinley will catch on quickly and we will both be so much happier. After so many gorgeous days outside, I completely forgot what I used to do to keep my girl busy when we were stuck inside. 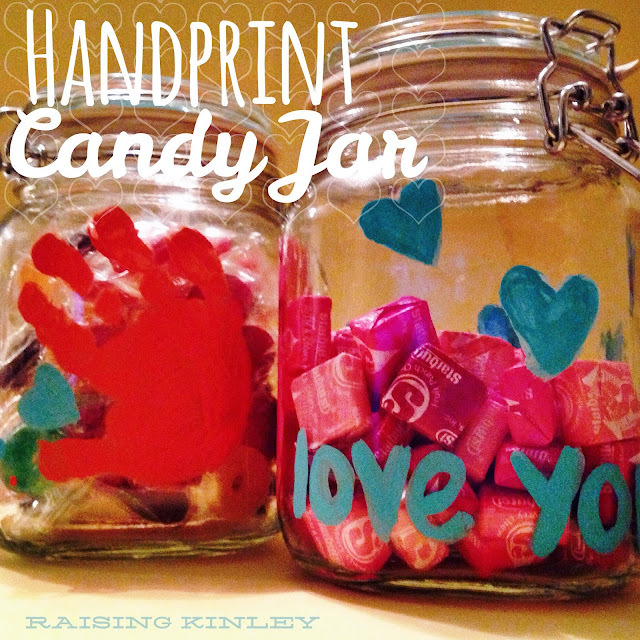 When I realized yesterday that it was too chilly to go out for very long, I started racking my brain for something fun to keep Kinley busy for a bit. She didn't feel like coloring or painting or playing Legos. She didn't wanna play Little People or ball pit or read a story. 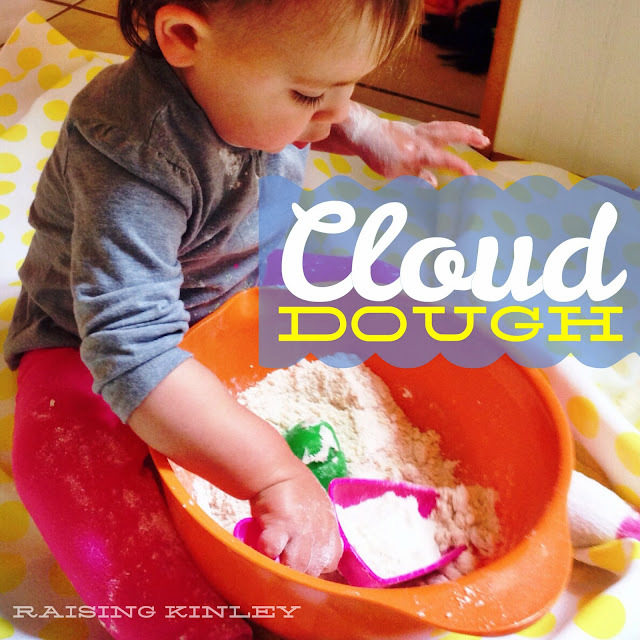 And then it came to me: our old favorite sensory substance, CLOUD DOUGH! 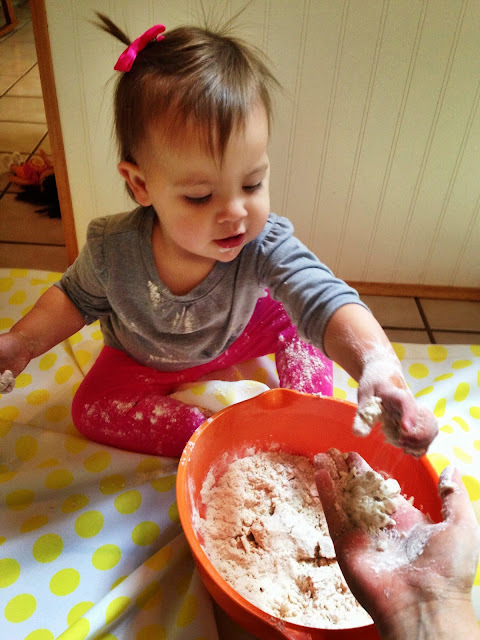 If you are a Pinterest addict like this SuperMom, you have probably already heard about Cloud Dough. But just in case you aren't or haven't, I'll share. The good news is it's really cool, really easy, and you probably have the stuff to make it already in your cabinets. So what could possibly be bad, you ask? Cloud Dough is always a HUGE MESS. I don't mean huge as in 10-minute-clean-up-and-wash-tiny-hands-in-the-sink type of huge. I'm talking the kind of mess that requires a wardrobe change for everyone who even walked in the room where Cloud Dough was being played with, bath time, and multiple trips around the room with a broom and Swiffer and still finding some smushed in the grout. I know you are thinking cows will speak German before you will ever let your tiny human play with this stuff after that warning, but you should really try it once. That warning was not meant to scare you, just to prepare you! 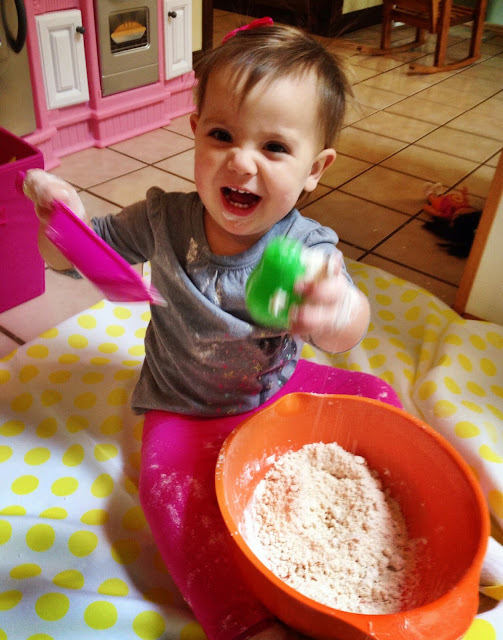 Kinley absolutely loves Cloud Dough and when you only make it once every six months you tend to forget what a giant pain it is. Besides, maybe your tiny human will just neatly keep it all in the bowl and cooperatively wipe his/her hands on the damp towel you provide. HA. That's it! 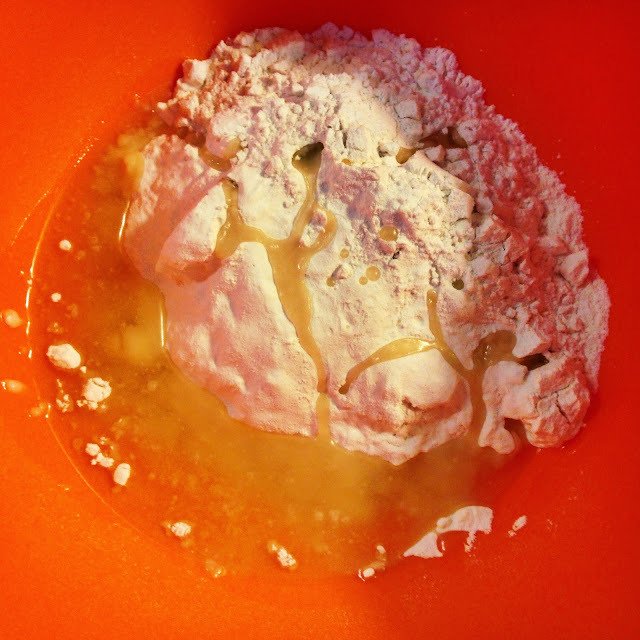 Flour and oil! I actually halved the original recipe I found for this stuff. It would be really fun to make a huge batch if you were going outside I think. I do not even want to think about the flour nightmare SuperBaby would've made with double the Cloud Dough. 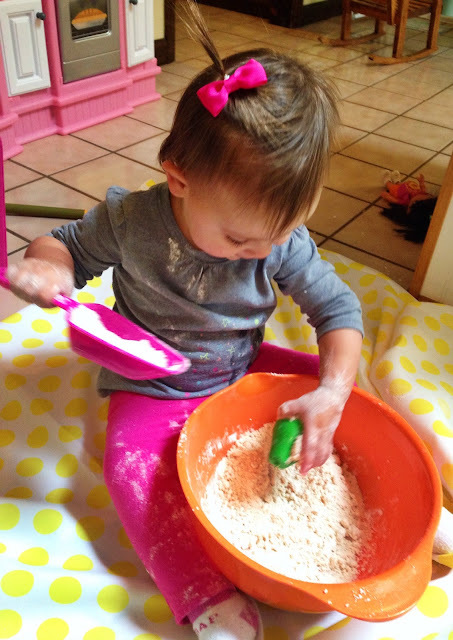 I plopped a big tablecloth on the kitchen floor for us to play on in hopes of containing the mess (not extremely successful), set the bowl on that and let Kinley help me mix the flour and oil together. We just used our hands. The cool thing about Cloud Dough is that it just feels light and fluffy like flour (or a cloud) until you squeeze it or pack it into something and then it sticks together kind of like wet sand. But when you break up the clump, it turns right back into its fluffy cloud state. 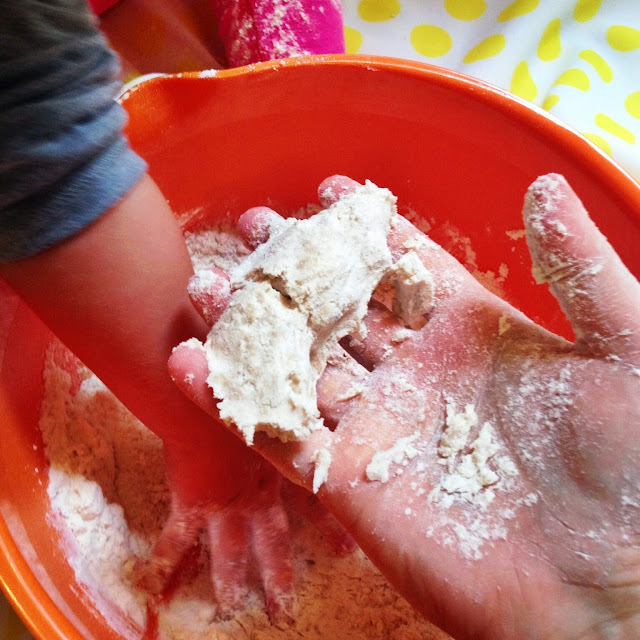 We had fun packing the Cloud Dough into Kinley's sensory scoops and digging for the plastic fruits I hid in it for her. And of course, flinging it in the air and dumping it by the scoopful on the exact edge of the tablecloth. 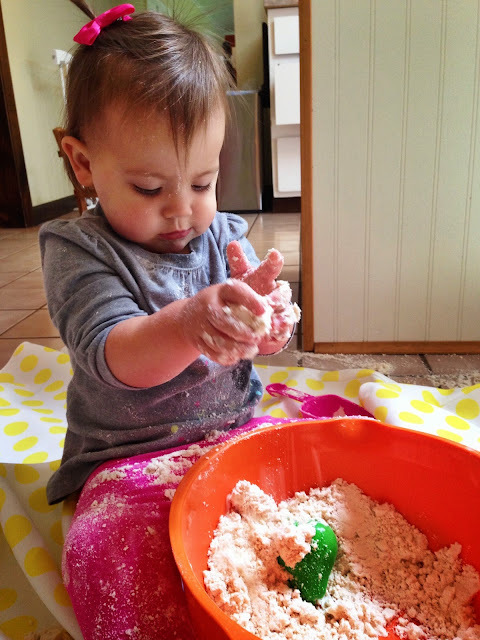 But, mostly, she just had a ton of fun squeezing it in her little fists and stirring the cloud dough around with her tiny fingers. 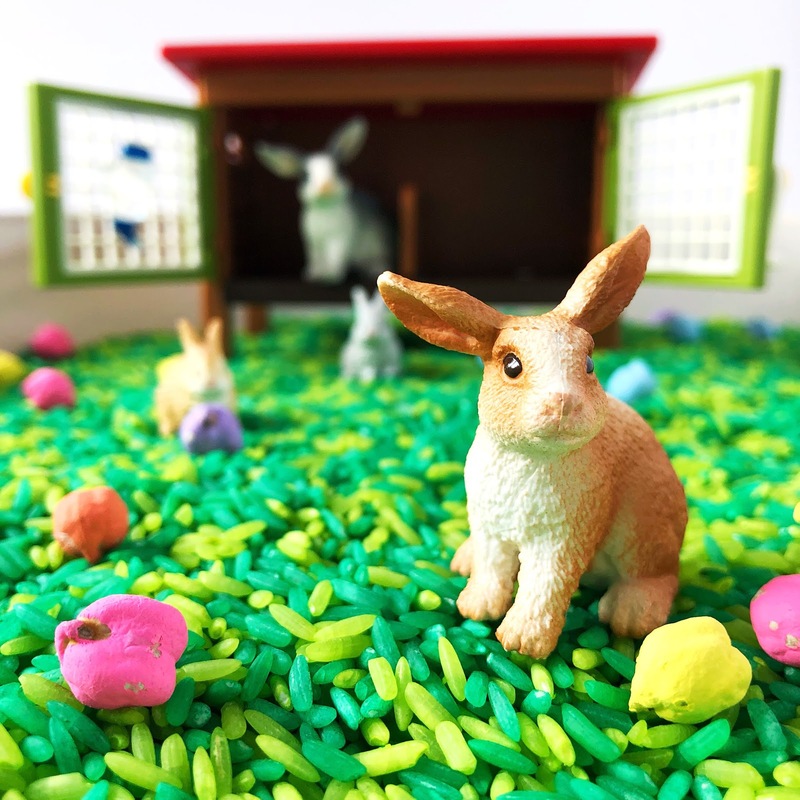 The mess she made may have been legendary, but all those squeals and smiles made the epic clean-up completely and totally worth it. Hopefully the sun will come out tomorrow and we can get back to our regularly scheduled, and much less messy, activities. I have such a bad habit of dreaming up huge homemade present ideas and then waiting until the exact last possible minute to get started on them. This Mother's Day is, unfortunately, no exception. I keep seeing all these cute painted Mason jar vases on Pinterest and decided that was the perfect present for both of Kinley's Grammas. 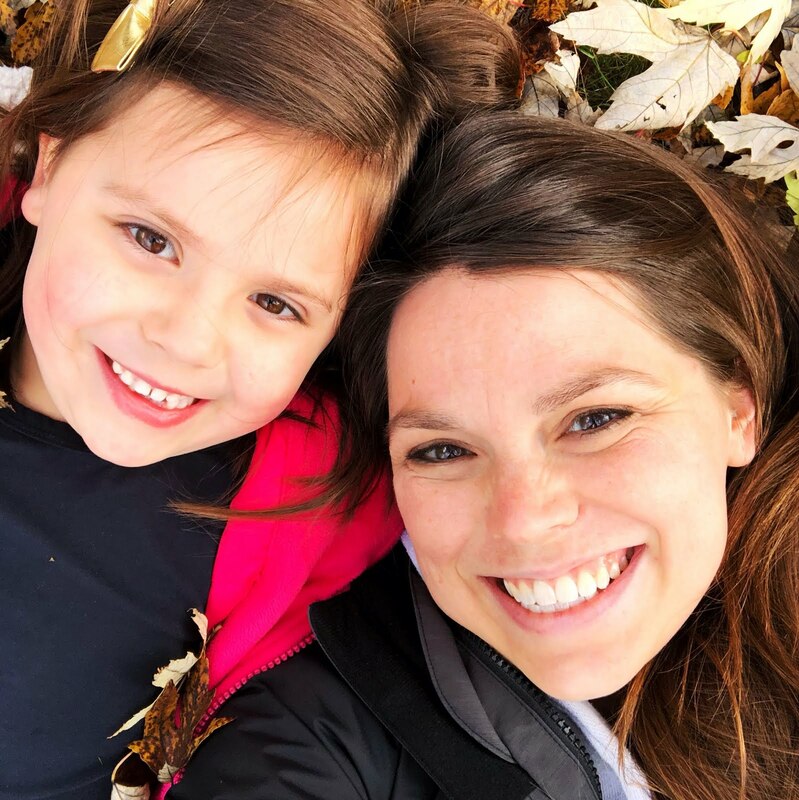 They both love flowers and have gardens and what better way to show off your homegrown beauties than a rustic vase painted by your way-too-cute grandbaby? I waited until today, of course, to go on the hunt for Mason jars and, surprise, no stores that I had time to search had them. So, Plan B, I decided Kinley would just paint terra cotta pots for the Grammas to show off their homegrown flowers in progress. Bad news again. No terra cotta anywhere. Just lots and lots of plastic. You would think at some point I would learn my lesson and start presents that require many steps and gathering supplies more than two days before I want to hand them, in all their wrapped glory, to their recipient. Anyway, I had to come up with a Plan C on the fly. Kinley and I headed to the glass containers aisle at Meijer to see if there was ANYTHING that could work. While SuperBaby sat in the plastic pool she insisted I carry with us and played with a little Nerf ball that we weren't buying, a ray of light shone on my head and angels started singing: A CANDY JAR! That's it! 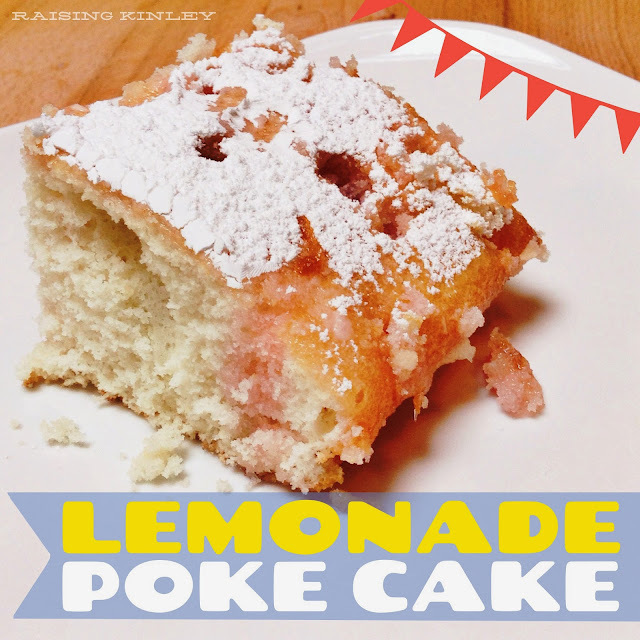 This gloomy, yucky day called for a super yummy, sunshine-y treat, and when I think sunshine and sugar I think of my Nana's lemonade cake. 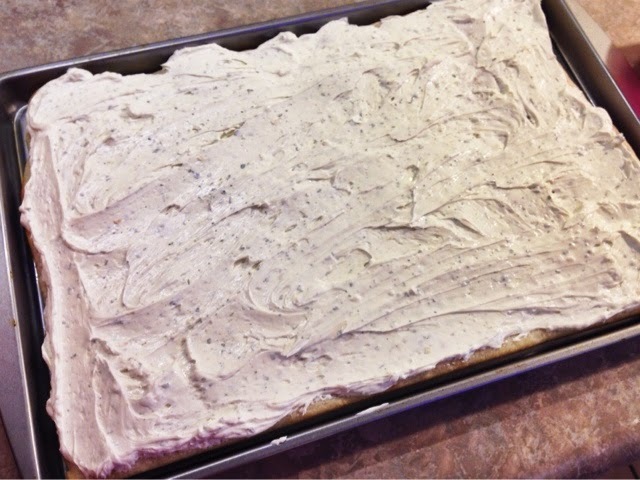 Oh my gosh, it's so delicious and so simple--perfect!